Draft: 2003, San Francisco Giants, 24th rd. Brian Patrick Wilson...played three seasons of college ball at Louisiana State University from 2001-03, going 18-10 with five saves and a 3.95 ERA in 51 games (22 starts)...played baseball, golf and basketball at Londonberry (NH) High School...established the Michael Wilson Scholarship Program in 2011 to honor his late father, who was a 22-year Air Force veteran...the fund annually grants two Air Force ROTC cadets in the United States money towards college and is the largest scholarship donation given by an individual that the Air Force Academy has administered in its history...active with the Junior Giants and the Giants Community Fund while with San Francisco...has participated in the Strikeouts for Troops program to help wounded soldiers and their families... supports Major League Baseball's efforts with Susan G. Komen for the Cure and Going to Bat Against Breast Cancer... originally selected by Cleveland in the 20th round of the 2000 First-Year Player Draft, but did not sign...selected by San Francisco in the 24th round of the 2003 First-Year Player Draft and signed by scout Tom Korenek. Was among Major League leaders in saves prior to missing month due to injury...however, stillranked tied for 8th in National League with 36 rescues, his 4th-consecutive season with35+ saves ... Overall, went 6-4 with 3.11 ERA (19er, 55.0ip) in 57 gamesin his 6th season in Giants uniform...went 36-for-41 insave chances ... His 6 wins were career-high for single season ... Was named to his 3rd career All-Star team where hebecame only 2nd pitcher since 1969 to earn save in All-Star Game after recording save in clinching game ofprevious World Series...Dennis Eckersley did it in 1989WS then in 1990 ASG at Wrigley Field ... Posted 8.8 strikeouts per 9.0 innings, his lowest ratiosince 2007 (6.8)...allowed 5.1 walks per 9.0ip, his highestfigure since 2006 ... Giants were 50-7 when he appeared in game ... Allowed at least 1 baserunner in 42 of his 57 appearances ... Began year on 15-day disabled list with left oblique strain,suffered during spring training on March 17 after scorelessrelief inning ... Was reinstated from DL on April 6 (missed 1st 5 gamesof season) ... Was placed on 15-day disabled list again Aug. 21 (retroactiveto Aug. 16) with inflammation in his right elbow...satout 5 games from Aug. 16-20 with injury...had surrendered3 runs in 9th inning of Giants' 5-4 walk-off loss to Bravesin Atlanta on Aug. 15 and Wilson said he felt somethingon one of his 28 pitches...flew to Pensacola, Florida onAug. 17 to visit Dr. James Andrews ... After missing more than month was reinstated from DLon Sept. 18, but appeared in just 2 games and was shutdown for remainder of year as Giants fell out of playoffcontention. 2010 All-Star was one of top closers in National League, finishing campaign with career-highs in saves (48), games (70), innings pitched (74.2) and strikeouts (93) in what was his 5th season at Major-League level ... Matched Giants' franchise record for saves in single season with his rescue in Giants' playoff-clinching win on Oct. 3 vs. San Diego (tied Rod Beck's total of 48 in 1993) ... His 48 saves led Majors...became 1st Gants pitcher since save became an official Major League Baseball statistic in 1969 to pace Majors in saves...there has been only one other player in Giants history to lead NL in that category and that was Robb Nen in 2001 (45) ... Converted 48 of 53 save opportunities and his 90.6 save percentage was 4th-best in NL ... Reached 40-save plateau for 2nd time in his career, joining Robb Nen as only Giants pitchers in SF-era history to have multiple seasons of 40-or-more saves (Nen had 4 40+ save seasons with Giants) ... Was 10-for-12 in save chances when pitching more than 1.1 innings...his 10 4+ out saves were most by any ML closer ... Registered 93 strikeouts against 26 walks...posted career-high 11.21 SO/9.0 figure while logging his best SO/BB ratio of his career (3.58) ... His 1.81 ERA was 4th-lowest figure among NL relievers and his 93 Ks were tied for 5th-most ... During Spring Training signed 2-year contract extension for 2011 and 2012 ... Made Opening Day roster for 3rd time in his career ... Sealed his 7th save of season May 9 against Mets at Citi Field, striking out all 5 batters in 1.2 innings to preserve Giants' 6-5 victory...according to Elias, Wilson became 1st pitcher in SF-era history to earn save of 5 or more outs while registering each with strikeout...only other Major League pitcher to accomplish that over last 12 seasons (1999-2010) was Toronto's B.J. Ryan on July 1, 2006 against Phillies ... Allowed game-tying 2-run, pinch-hit home run to Pittsburgh's Delwyn Young in 9th inning on June 6 at PNC Park...2-run blast by Young tied game at 5-5...however, Giants scored in top of 10th to win 6-5 ... Was named to his 2nd All-Star team, joining teammate Tim Lincecum in Midsummer Classic...tossed scoreless 8th inning to preserve NL's 3-1 lead in eventual victory at Angel Stadium of Anaheim ... Experienced back spasms prior to game on July 30 vs. Los Angeles-NL and was unavailable to pitch that night in SF's 6-5 victory ... Beginning Aug. 1st, allowed just 3 earned runs over his last 28.1 innings (0.95 ERA) ... Recorded his 5th 5-out save of season and his 42nd rescue overall, setting new career-high, in SF's 1-0 win over San Diego on Sept. 10 at PETCO Park that forged virtual tie atop NL West ... Matched Giants' franchise record for saves in single season with his save in SF's playoff-clinching win on Oct. 3 vs. San Diego, tying Rod Beck's total of 48 in 1993. POSTSEASON HIGHLIGHTS: Went 1-0 with 0.00 ERA (0er, 11.2ip) and 6 saves in 10 postseason contestS ... earned save in each clinching round of playoffs, posting rescue in Game 4 of Division Series vs. Atlanta, Game 6 of Championship Series vs. Philadelphia and then in Game 5 of World Series vs. Texas ... His 6 postseason saves were one shy of matching Robb Nen (7 saves in 2002) for most by Giants reliever in one postseason ... His 16 strikeouts were 2nd-most as Giants reliever in single postseason, behind Jesse Barnes (18 in 1921 World Series) ... Received win and 3 saves in LCS, becoming 4th pitcher to win or save 4 games in one postseason series since saves became an official Major League statistic (in 1969), joining Dennis Eckersley (1988 ALCS), Mitch Williams (1993 NLCS) and John Wetteland (1996 World Series) ... Tossed 1.2-scoreless innings in SF's clincher over Phillies in Game 6 of LCS on Oct. 23, becoming 1 of 4 pitchers in last 25 years to record save of 5 or more outs to clinch postseason series...joined Jesse Orosco (1986 Mets), Randy Myers (1990 Reds) and Byung-Hyun Kim (2001 Diamondbacks) ... Allowed just one hit in 8 at-bats over 3 scoreless outings in World Series vs. Texas. An NL All-Star for 1st time in his career in 2008, 27-year-old, hard-throwing righthanderemerged as one of top closer's last season, sealing 41 saves, tied for 4th-most in Majors andtied for 2nd-most in NL...became 1st Giants reliever to be named to NL All-Star team since RobbNen in 2002 and was 8th SF reliever to be selected for Mid-Summer Classic, joining Stu Miller(1961), Gary Lavelle (1977, '83), Greg Minton (1982), Scott Garrelts (1985), Jeff Brantley (1990),Rod Beck (1993, '94, '97) and Nen (1998, '99 and 2002)...is just 3rd pitcher in Giants history toreach 40-save plateau in single season, with Beck setting club standard with 48 rescues in 1993...Nen reached mark on 4 different occasions (2001 - 45, 2002 - 43, 2000 - 41 and 1998 - 40)...became 10th Giant pitcher in club history to reach 20-save mark before All-Star Break in 2008...has made 118 ML relief appearances over last 3 years, while converting 48 of 56 ML save chances(85.7%)...has posted 1.23 ERA (7er, 51.1ip) and .183 avg. against (33-for-180) in his 48 career saveefforts...was Giants' 24th round selection in 2003 First-Year Player Draft, but missed that entireseason due to "Tommy John" surgery on right elbow. Spent most of season in triple-A Fresno, but enjoyed stellar 6-week stretch withSF to conclude campaign...was recalled Aug. 11, going 1-2 with 6 saves (7 chances), 2.28 ERAand .188 avg. against (16-for-85) in 24 ML appearances...even those impressive numbers don't tellwhole story, as without Sept. 25 outing against San Diego (1.1ip,4h,4er), logged 0.81 ERA (2er,22.1ip) and .156 mark (12-for-77) in 23 efforts...dominated right-handed batters, yielding just 9hits (7 singles and 2 doubles) in 62 at-bats (.145)...tossed SF reliever-high 11.2-consecutive shutoutinnings Aug. 11-31, spanning 11 outings...pitched in 16 of SF's final 21 wins, working 8th inning8 times (including 1 win), logging 6 saves and finshing 2 other contests...converted each of his 1st6 save opportunities, including rescues on consecutive days for 1st time in career (Sept. 22 and 23vs. Reds)...went 1-2 with 11 saves (13 chances), 2.10 ERA and .194 avg. against (24-for-124) in 31outings with Grizzlies...missed time May 21-June 10 following appendectomy...pitched in 3 gameswith single-A San Jose before returning to Pacific Coast League. Logged 4 different ML stints during 3rd professional campaign, pitching for Giants April 23-May 20, May 23-June 6, July 1-Aug. 12 and Sept. 1-end of season...went 2-3 with save and 5.40 ERA in 31 big league relief outings...however, posted 3.86 mark (8er, 18.2ip) over his last 20 appearances, including 17-scoreless efforts...stranded 15 of 17 inherited runners (88.2%), while opposing batters hit just .100 (3-for-30) off him in RISP situations...held right-handers to .235 mark (16-for-68) on year...had his contract purchased from triple-A Fresno April 23, and made ML debut that day with 2.0-scoreless innings at Colorado...however, suffered left oblique strain during contest and landed on DL next day...was optioned to minors upon May 20 activation...earned 1st big league save July 2 at San Diego, working final 1.2 innings of SF's 6-2 victory...recorded 1st ML win July 19 vs. Milwaukee, tossing scoreless 9th before Giants plated 2 runs in bottom of frame for comeback victory...posted 1-3 mark with 7 saves and 2.89 ERA in 24 outings with Grizzlies...also pitched in 1 game for single-A San Jose while on rehab assignment...dominated competition in Puerto Rico Winter League, sharing circuit lead with 14 saves...was unscored upon in 17 outings (16.2 ip), while limiting opponents to .094 avg....struck out 21 batters. Excelled during stops at 3 levels of Giants' chain, going combined 6-2 with 21 saves and 1.35 ERA (9er, 60.0ip) in 50 relief appearances...save total matched San Jose's Joe Bateman for tops in SF organization...yielded miniscule .172 avg. against (37-for-215), including .190 mark (8-for-42) while pitching for triple-A Fresno...opened year with single-A Augusta, and was tabbed to South Atlantic League mid-season All-Star squad after going 5-1 with 13 saves and 0.82 ERA (3er, 33.0ip) in 26 outings...logged 8 saves with 0.57 mark (1er, 15.2ip) in 15 contests at double-A Norwich. After not pitching in 2003 while recovering from Tommy John surgery, opened professional career at single-A Hagerstown...worked in 23 games (3 starts), going 2-5 with 3 saves and 5.34 ERA. Was selected by San Francisco in 24th round of draft...however, did not pitch while recov ering from"Tommy John" surgery. 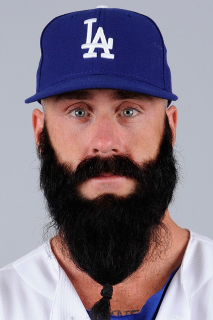 December 19, 2014 Los Angeles Dodgers released RHP Brian Wilson. December 16, 2014 Los Angeles Dodgers designated RHP Brian Wilson for assignment. April 15, 2014 Los Angeles Dodgers activated RHP Brian Wilson from the 15-day disabled list. April 5, 2014 Los Angeles Dodgers sent RHP Brian Wilson on a rehab assignment to Rancho Cucamonga Quakes. April 2, 2014 Los Angeles Dodgers placed RHP Brian Wilson on the 15-day disabled list retroactive to March 31, 2014. Right elbow ulnar nerve inflammation. December 7, 2013 Los Angeles Dodgers signed free agent RHP Brian Wilson. August 19, 2013 Los Angeles Dodgers activated RHP Brian Wilson. August 9, 2013 sent RHP Brian Wilson on a rehab assignment to Albuquerque Isotopes. August 7, 2013 sent RHP Brian Wilson on a rehab assignment to Rancho Cucamonga Quakes. July 30, 2013 Los Angeles Dodgers signed free agent RHP Brian Wilson. November 30, 2012 RHP Brian Wilson elected free agency. November 1, 2012 San Francisco Giants activated RHP Brian Wilson from the 60-day disabled list. April 27, 2012 San Francisco Giants transferred RHP Brian Wilson from the 15-day disabled list to the 60-day disabled list. September 18, 2011 San Francisco Giants activated RHP Brian Wilson from the 15-day disabled list. April 6, 2011 San Francisco Giants activated RHP Brian Wilson from the 15-day disabled list. March 30, 2011 San Francisco Giants placed RHP Brian Wilson on the 15-day disabled list retroactive to March 22, 2011. Left oblique strain.